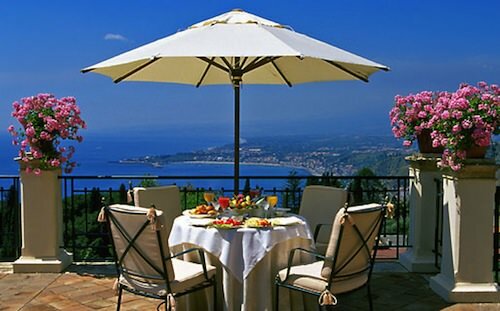 Grand Hotel Timeo in Taormina, Sicily has long been known as one of Italy’s most glamorous retreats. 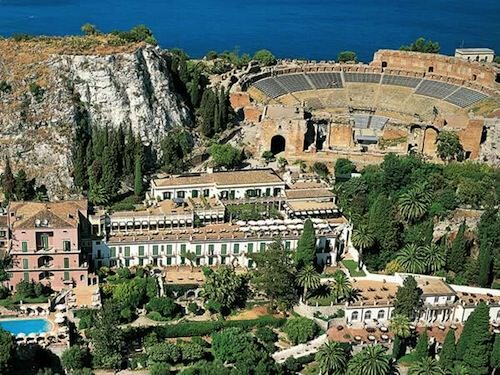 The first hotel to be built in Taormina, it sits directly across the Greek Theatre. Sweeping views of the coastline and majestic Mount Etna stretch out beyond. The hotel is part of Orient-Express hotels group. All 70 rooms and suites at Grand Hotel Timeo are stylishly decorated with Italian flair. There are 4 types of rooms: double rooms, junior suites, suites and the Presidential Suite. Most have beautiful terraces or balconies. There is a heated swimming pool surrounded by lovely gardens overlooking the bay. There is also a fitness centre for guests who want to stay in shape. The Grand Hotel Timeo provides a complimentary shuttle service to and from its sister property Villa Sant’Andrea in Taormina Mare, where guests can enjoy the private beach on the bay of Mazzarò. The town of Taormina is the jewel of Sicily: built on the cliffs of Mount Tauro, the town affords spectacular views of the coast with its rugged rocks, sandy coves and crystal waters, and offers a prime viewing spot for sweeping panoramas of Mount Etna, Europe’s largest volcano. Mount Etna is still active and erupts from tine to time. At night, the lights twinkling in Capo Taormina — the seaside area of the town — and the curve of the bay of Giardini Naxos are inexpressibly beautiful.